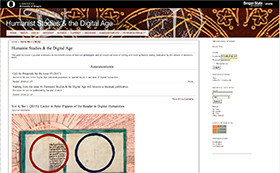 The Digital Scholarship Center (DSC) seeks to help researchers in our community to manage their information through the research process and through the process of communicating research results to the broader scholarly community and to the public. 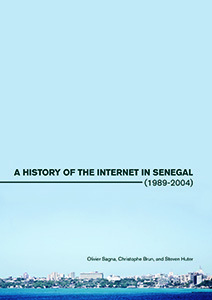 The contemporary publishing landscape offers many options, both Open Access and traditional. For more information about selecting the right journal for your research, Think. Check. Submit. is an excellent resource. Questions about scholarly publishing—authors' rights, open access initiatives, or UO Libraries' publishing services—should be directed to dsc@uoregon.edu. 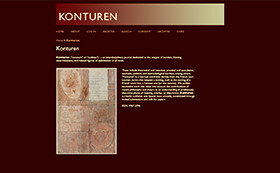 Konturen is an interdisciplinary journal dedicated to the analysis of borders, framing determinations, and related figures of delimitation of all kinds. This peer-reviewed e-journal is devoted to the reformulation of received philological and philosophical ideas of writing and reading literary works, motivated by the advent of electronic texts. 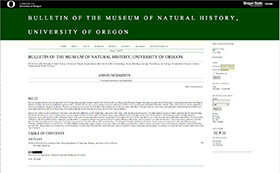 The Bulletin of the Museum of Natural History, University of Oregon, accepts original articles in the fields of Archaeology, Botany, Ethnology, Geology, Paleontology, and Zoology, with preference for topics related to Oregon and the Pacific Northwest. 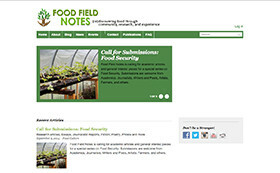 Food Field Notes is a dynamic online community that brings together journalists, farmers, poets, biologists, environmentalists, archaeologists, artists, sociologists and others to share knowledge about food and culture. 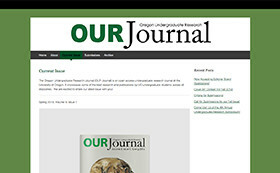 The Oregon Undergraduate Research Journal (OUR Journal) showcases undergraduate student research. 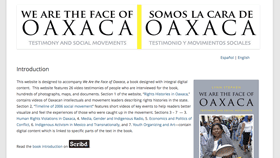 This website is designed to accompany We Are the Face of Oaxaca, a book created with integral digital content. This website features 26 video testimonies of people who are interviewed for the book, hundreds of photographs, maps, and documents. 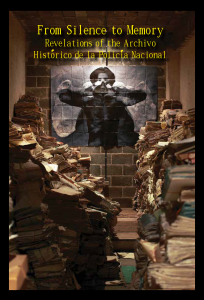 "The original publication of the report Del silencio a la memoria was unanimously praised as a step forward in both making the work and mission of the AHPN widely known and offering a synthesis of its potential to understand how systematic state repression worked. The story told in this report is an exemplary case of commitment with the past and the future of a society still recovering from the wounds of violence and social injustice." Thailand was an early participant in bringing the Internet to Asia, and it has a fascinating, but little-known, networking history. The grassroots efforts by a few dedicated and visionary university professors have resulted in a fully functional national network, despite the limited infrastructure and numerous technical obstacles of the early days. This manuscript provides a detailed look at the background of this technological movement, and is available in English and Thai. Copies of articles, books, data, white papers and more may also be made available via Scholars' Bank, the University of Oregon's open access repository.